Happy Monday Kitchen Fam! April is already upon us and I can't believe how fast this year is going by. However, I will admit that I'm REALLY looking forward to the warmer weather and grilling season! Speaking of grilling, a few weeks ago I asked y'all for recipes you have always wanted to try, but just didn't know how. One of the very first responses I got was for Shawarma. 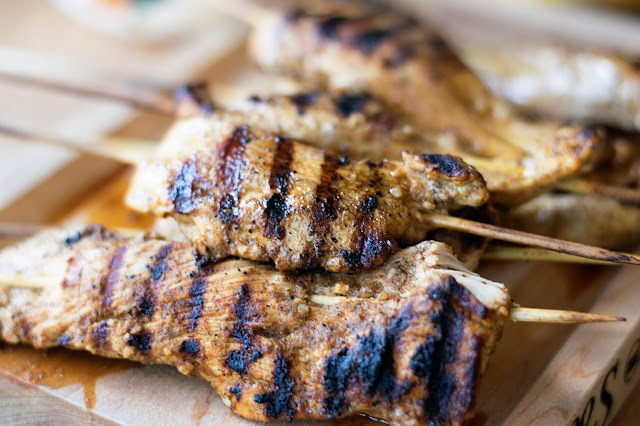 Traditionally Shawarma is meat (lamb, beef, or chicken), marinated in spices, that has been grilled on a spit, thinly shaved off, and served in a pita. Since clearly I do not have a spit in my kitchen, I had to get a little creative, but the flavors are ON POINT with what I had at Chams. 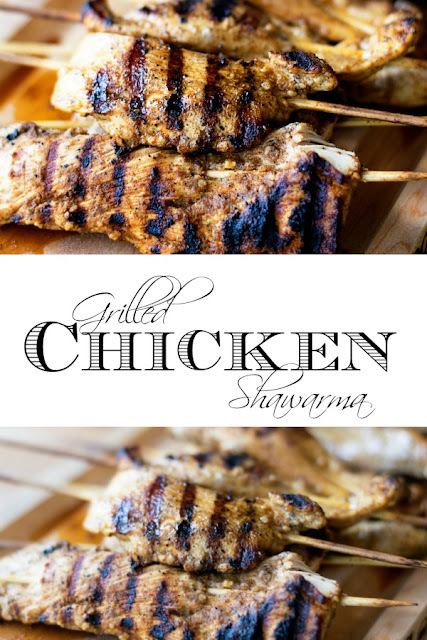 The first step in this Grilled Chicken Shawarma Recipe is the marinade. Combine the garlic, cumin, coriander, cardamon, smoked paprika, salt, pepper, cayenne, olive oil, and lemon juice into a small mixing bowl. Secondly, you will need to cut the chicken breasts into 3-4 strips per piece. and pour the marinade over the chicken. Seal the bag and massage the marinade over all of the chicken, so the every piece is coated. Y'all I wish I could explain with words how delicious this marinade smells. It's warm and fruity, I couldn't wait to try it. Now you will place the chicken into the refrigerator for at least 30 minutes, but I recommend letting it marinate overnight. Since I do not have a open fire spit in my kitchen, I decided grilling would be the best cooking method for this Grilled Chicken Shawarma would to be cook it on the grill, but to keep the cooking process as authentic as possible I decided to place the chicken on bamboo skewers. You will need to soak the skewers in water while the chicken is marinating so they will not burn up. Once the chicken has finished marinating, you're going to remove the chicken from the resealable bag and weave it onto the skewer. It was pouring down the rain the day I made this, so I had to use my indoor grill pan. Make sure it gets nice and hot, spray it with some cooking spray, and place the chicken on the grill. Cook for 4-6 minutes until you see the meat turn white half way up the chicken strip. After 4-6 minutes flip the chicken, cover with the lid from one of your pots (this helps the chicken to cook through evenly), and cook for another 4-6 minutes until the juices run clear and are no longer pink. Just whisk that all together and use it as a dip for the chicken. YUM! I served this up with some Tabouli (Tabouleh) Salad, Saffron Rice Recipe, and some homemade pitas I bought from the local restaurant. It was a amazing and I'm stoked to have it in my repertoire! Trying something new can seem a little overwhelming, but do your research, think about how you can make it work for you and your kitchen, and give it a try. You never know when you are going to have a huge success like this one and open yourself up to new things. 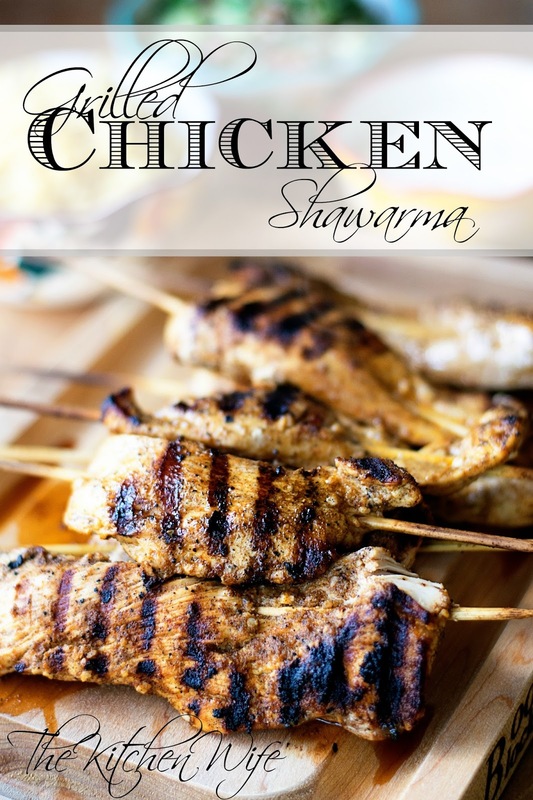 I know y'all are going to love this Grilled Chicken Shawarma Recipe, so give it a try tonight and I would love to hear any other recipes you would like for me to try in the future. In a small mixing bowl combine the garlic, cumin, coriander, cardamon, paprika, salt, pepper, cayenne pepper, olive oil, and lemon juice. Whisk together until smooth. Cut the chicken into 3-4 strips per breast and place into a resealable bag. Pour the marinade over the chicken, seal it, and massage until all of the chicken has been coated with the marinade. Place in the refrigerator for 30 minutes to overnight. If you are using bamboo skewers you will need to soak them in water while the chicken is marinating. When the chicken has finished marinating, remove it from the resealable bag and weave it onto a skewer. Grill the chicken for 4-6 minutes on eat side until the juices run clear and are no longer pink. Combine all of the ingredients together into a small bowl.